I know I'm seriously lacking in the area of boy's clothing. But I'm sure today's guest giveaway will help to make up for that. Steph of Baby by Stevie is offering one lucky Grosgrain winner a bow tie and neck tie of their choosing from her charming little shop. 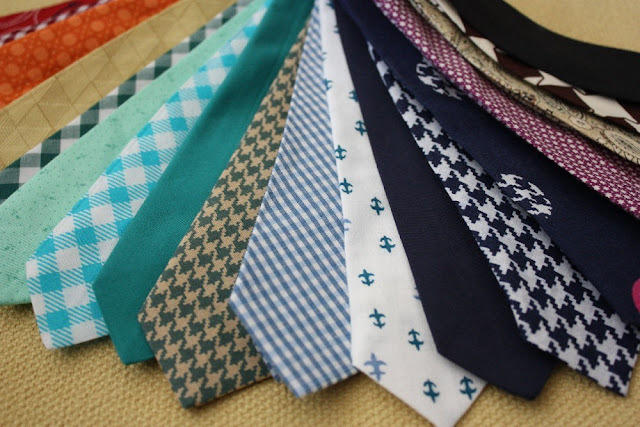 Couldn't you just picture one of these cute neckties paired with a crisp white shirt. Heck, I'll take one in a men's size...pleeaze. Love them. Steph, aka Stevie, got her nickname in college, where she majored in clothing design and followed her dreams, moved to NYC after graduating to work for Vera Wang (and met her husband!). She's made plenty of women's clothing and even a custom wedding gown, but when her baby came along she realized how much more fun baby items are to make! She loves making stuff for him - his bedding, crib mobile, blankets, outfits, etc. So, she decided to open up this little shop: Baby by Stevie. 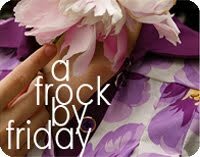 AND STAY TUNED FOR THURSDAY'S FROCK BY FRIDAY LATER TODAY. Those ties are just the cutest! I would love to have one for my Jack! Totally adorable..my little guy would look so handsome in one of these. Fingers crossed! Oh my word those are so sweet. Ohhh, how cute! My nephew would look so spiffy in one of these! Too Cute, I hope I win. oh my oh my....i have 3 little boys that would look mighty handsome in these ties!!! thanks! Adorable! My boys are too big, but those ties would be sweet on my nephew. pick me! pick me! Oh man, these would be ADORABLE on my little one! Oh, those are adorable! I'm always looking for cute, yet manly stuff for my little guy. I love these neckties! I can absolutely see my nephew rocking one in his ring bearer glory at my wedding in December! Hooray! A giveaway for boys! I can just envision my little mand wearing these! My baby boy would be adorable in these.. I'm checking out her site for father/son sets now! Such cute ties! I would love for my little man to wear one!! Wow! Those are SO cute! Since I'm due in four weeks to have a baby boy winning one of those would be perfect. :-D I love the lime green stripe tie and ANY of the bow ties. They are just precious! OMG, these are AWESOME! 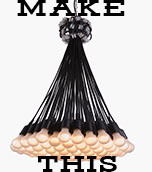 I never see cute stuff for boys, all the make-it-yourself posts are for girl clothes. Seeing as everyone always guesses my little one IS a girl (he's an adorable little BOY), a tie would be great! Holy cow those are adorable! I have two boys and I'm thinking they would be so cute in matching ties! A bow tie on the baby and a regular tie on the big boy. Ooooh! Oh my goodness those are cute! Thanks for the giveaway! I don't have any boys of my own but my 2 nephews would look adorable in something like that! YAY!!! Boy stuff!! And they are TOTALLY cute!! Thanks for a boy giveaway. Too cute, hope I win!! Those are so cute! Would love to have one! Adorable and just what I've been looking for! I need a tiny bow tie for my youngest nephew to wear at my wedding. Linked! One for each son...too cool! Such cute little ties! My Sam or Ethan would look SO CUTE in one of those! So adorable, my son would look like a stud in one of these. So cute! I love this idea! My son would look so cute in one of her designs! Love those! My son would look so cute. These are so cute, I can't even stand it! 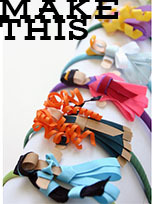 I wish I was a good enough seamstress to make one...maybe one day :) I also linked to my blog, thanks for sharing!! One of those would look so cute on my little man! Those are totally adorable! I just had number 3, so this would do for any of my three boys! I hope I win! Darling! Seeing such cute baby stuff almost makes me want to have another. I love these ties! They are so cute! I have a hard time trying to get my son to leave his on for church, it's much better than having a clip on. Oh. my. word. Stinkin cute! I've been looking for bow ties and ties fro my two boys forEVER and these are darling! Linking up right now! Adorable! And now I have a little boy to put it on! I love these -- hoping to score one for my little guy. Those are so cute! It's almost impossible to make my nephew any cuter, but he just might with a little tie! I adore her creations, so lovely! JUST WAY TOO ADORABLE!!! My nephew would look adorable! Oh please oh please oh please, I hope I win. Perfect for church! What an awesome touch for little guys! My son would love to wear one, because he always wants a bib like his little sister! Oh my cuteness!!! My baby boy is due next week and I need these!!! soooo cute! I have to have one! With two boys, I am always on the lookout for cute clothes! 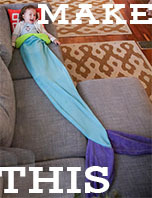 Oh I want one of these for when my little guy finally gets here! They are so cute Steph! I'd love to win for my boy (and his soon-to-be little brother)! I wish I had found this b4 I went to Brazil for my sister weeding. It was hard to find a cute tie for Lucas. 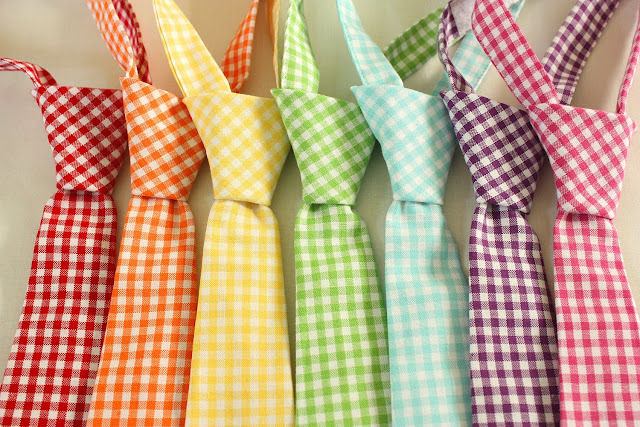 Oh I am in LOVE with those gingham ties!!! 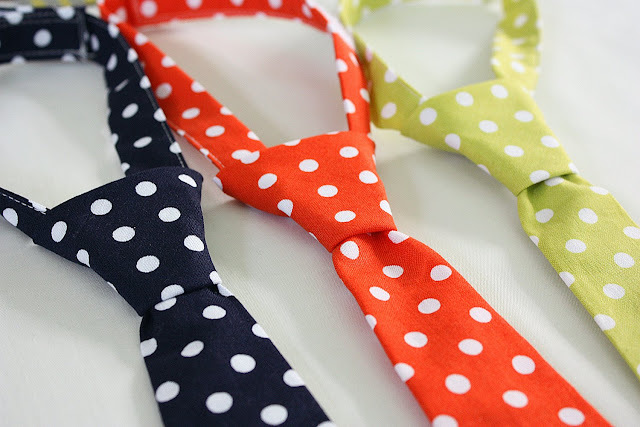 The ties are SO cute and I would LoVe one of these for my little man! Oh my! These are just sooo adorable! The hard part would be picking just one design! I love the ties. And they would look so adorable on both of my boys! Ohh, I've been wanting to get a tie for my little guy. These are so cute. hey I linked via facebook adorable, I'm so hoping I win! so cool! I love the fabrics! These are great! We're adopting two little boys and they'd look great in these! Oooh, my baby bud would look so dapper wearing one of these ties to church on Sunday! Love to see cute boy stuff! It is hard to come by. I just bought a tie pattern. These are much better then anything I could produce. cute boy stuff, would love one for my jay. very cute!! Finally i have a boy baby to give this to! I'm checking our her shop now, these are adorable! those would be perfect for my little man. I love the sailor stripe one of her website! I love that kind of stuff, my husband is in the Navy and it's so fun to find things w/ anchors on it! With four boys I NEED these! So darling! Love the ties - especially the bowties. Too Too cute! They're so summery! I don't know if my three boys would like them, but I would. So fun! I bet my boys wouldn't mind wearing their ties to church every Sunday if they had fun ones like these! Those are so cute! My daughters would wear them(with a skirt or tutu of course)too. Perfect for my little man! So fun to dress him after 4 little girls!! These are darling ties! I would love to win one for my little guy! Little boys look SO adorable in ties and bowties! I can't wait to get my boy into one of these. Love the matching bows and ties for siblings! I would love one! They rock! oh wow oh wow oh wow! I love them all! This is super adorable! Thanks for the chance to win! So great to see baby boy accessories! And ones that are super cute too!! Oh, I love the one with the hearts pattern! Sweet! So cute! Would love one for my nephew to wear to church!! Those bow tiew are just soooo cute! I have linked to my blog and I am keeping my fingers crossed! They are amazing! I love bow ties, I'm planning to make some soon. I love the selection of colours! My little heartbreaker is 2 and his name is Matthew. I'm sure he'll be the talk of sunday school class when he wears such a cute tie!!! Ooo. They are adorable and my little one needs a tie. Oh my goodness! My son pretty much wears a tie every day. He loves them. I would love to win one of these! I would love one for my grandson to be. Thanks. Those are adorable! I'd love to see my 3 year old dressed up like a little man. Thanks for the opportunity. Love these! I want a matching tie and headband for my son and daughter. So cute! How cute. And there is such an absence of cute boy clothes. 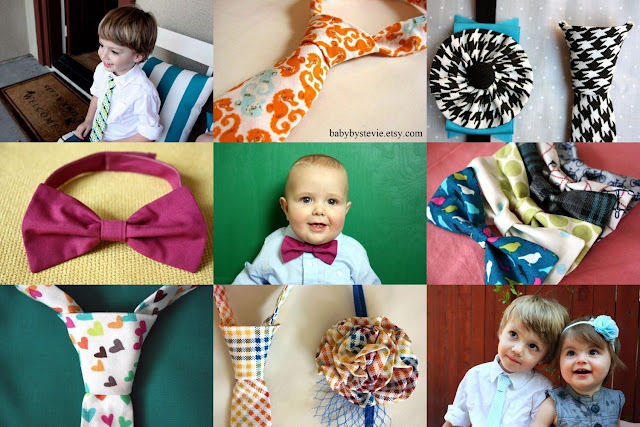 I would love one of those ties for my little one. OH these are perfect! Darling. I LOVE those ties! My boys would look adorable in them! love 'em!!! i want to wear them myself!!! the bowties are so cute, I'd really have no choice but to keep one for myself. These things are too cute! I love the fabrics that she uses! These are so cute!! I want one of each! I love baby boy ties and I need more of them! Those are adorable. I need one! I hope I get them! My baby boy would look dashing in one of these! !